I am fortunate enough to work from home most of the time. And like everyone else - my job sometimes gets a little stressful. 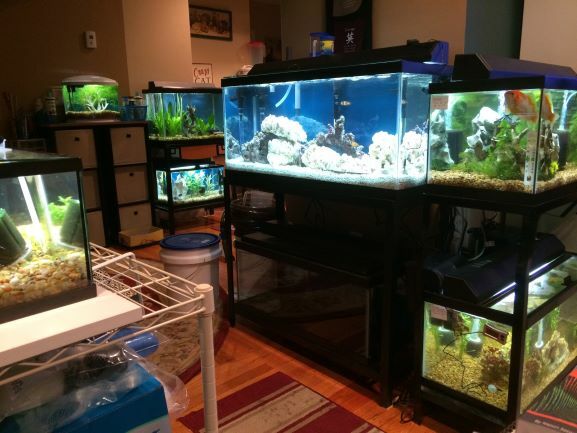 To counter this, I have a few fish tanks. Yes, I live inside an aquarium. The first one (that you can just see the edge of) - is a 5 stall betta tank (with the dividers removed). It's really tiny, but useful. I am keeping (and growing) a small foreground plant in this tank. You can see part of the plant in the reflection on the front of the tank (which makes it look larger than it is) in the picture. Tank 2 is a small 5 gallon bow tank - growing some hornwort for my goldfish. The goldfish have a tendency to nibble on it - so I'm growing some in another tank to provide a constant supply. It's pretty and useful. Tank 3 is the 20 gallon angel tank. It is still working its way through the nitrogen cycle with two angel fish and a corey catfish. It has a large sponge filter and an AquaClear 50 with a large helping of live plants. The plants appear to be getting fuller and note that all my tanks have some kind of decoration in them. I find that it helps with water changes. When I add water back into the tank, I pour it on the decoration so that the gravel is not disturbed. Tank 4 is a 10 gallon tank beneath the angel tank. The design of the stand will only fit a smaller tank on the shelf below. This is the "hospital" tank - now known as the crayfish tank. It seems to be almost done cycling (no ammonia) - but the load is actually very low. It only has one crayfish and one pleco. There are several mid-size live plants and I'm trying to grow some dwarf baby tears as a foreground plant. It also has a (smaller) sponge filter and a Penguin 150 hang on back filter. I love the Penguin filters, but I soon decided that I wasn't going to rely on them (as designed) to meet my filtration needs. I like the size of the box and strength of the impeller, but the filters.... I used the setup of the AquaClear to "upscale" my Penguins. I got a large block of the white sponge and cut it to size to fit at the bottom of the Penguin boxes. Then I used a bath pouf for netting - to hold a handful of the bio balls (normally used in cannister filters). I took the original charcoal/fiber filter and cut it in 4 and shoved that in at the top (again, wrapped in netting for easy removal). The cut filter retained the good bacteria generated so far and the other items and sponge filter gives plenty of opportunity for more growth than the original design. I left the bio wheel in place, but it really doesn't matter at this point if it spins or not. The cut filters will be replaced later by some some filter floss wrapped in filter pad once I feel like the rest of the media has become established. Tank 5 is my first saltwater tank (30 gallon). I have a couple of hunks of life rock and a few more chunks of "dead" rock. The substrate is CaribSea Arag-alive reef sand. I am using an undergravel filter (old school style) with two powerheads. I also added a thin hang on back protein skimmer. So my filter for this tank is 40 pounds of live reef sand. The rocks still need to be arranged and the skimmer needs to be powered on and tuned (for flow). It is a work in progress. Two cute clown fish are helping to cycle this tank. This will eventually become a reef tank with as many corals as I can grow. I expect this tank to be established (and just be in maintenance mode) sometime around the end of the year. This is not a fast hobby and requires quite a bit of patience. I'm really pleased that I decided to try a saltwater tank. With the freshwater tank next to it, you can see that the water in a saltwater tank looks very different. It's a lot of work and a lot of learning, but is so worth it. Tank 6 is the 20 gallon long goldfish tank. I've had most of these fish for quite some time. But now that I'm testing the water - I find that it's still cycling. It clouded up when I moved it, but now is crystal clear. It has a large sponge filter and an "upscaled" Penguin filter (as described above). It also has a healthy amount of hornwort for beauty, to clear the water and for the goldfish to nibble. Tank 7 is the 20 gallon long danio tank (this stand actually accommodates two similar sized tanks). It has a small sponge filter and two hang on back Penguin filters. One has been upscaled and the other is still using the filters that go with the Penguin. I only wanted to change one at a time since this tank is close to completing the nitrogen cycle. It has been at 0 ammonia for quite some time. It appears that this worked and changing the filter media did not interrupt the cycle. This tank has moneywort in the back of the tank and 4 other foreground plants. The plants seem to be growing a bit, but one plant seems to be constantly uprooted by the fish. Only part of the plant is being uprooted (not the entire plant) and I've pushed it back into the substrate twice. I think the fish want or need it to be floating, so I'm leaving it this time. 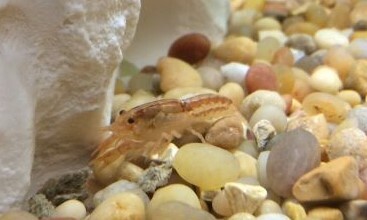 A few look like they may be pregnant and may be preparing the environment for babies. Tank 8 (which is hard to see) is the 20 gallon long tank that will be set up (soon) as a FOWLR saltwater tank. This is for Fish Only With Live Rock. Some saltwater fish are incompatible with coral (they eat it and it's really expensive). And some of the fish I wanted seemed to fit in that category, so I intend to set up a second saltwater tank. Please forgive/ignore the spots on the rug in front of the tank. 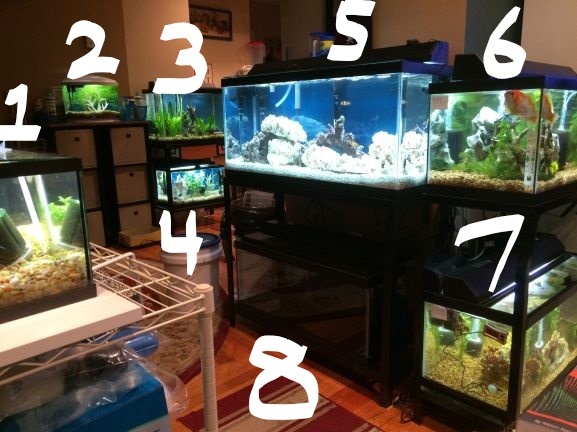 The photo was taken right after I "topped off" the tank above and got some water drips on the rug. I am hoping to set this up sometime this week - so that the saltwater tanks cycle around the same time.The arag-alive and 10 gallons of pre-made saltwater are waiting to go in the tank. My next trip to the LFS (local fish store) will get the other 10 gallons and some more rock. The biggest obstacle to creating this tank is finding adequate power. I will need to run an extension cord from another plug to this area to power the devices for this tank. The undergravel filter with two powerheads takes up twice the outlets of a hang on back filter.And I'm very against plugging a power strip into another power strip. As if that's not enough... in the "I need to find a place for them" category, we have two ten gallon tanks (that I want to set up with a fish bridge), one 10 gallon tank for "just in case," saltwater quarrantine tank or some off-hours emergency and one more tiny 3 stall betta tank that may be a frag quarrantine/frag tank (for coral fragments). So they do have a purpose. Now if I can just find a place to put them.